Restoring Classic Print Preview in Excel 2010/2013 » Accounting Advisors, Inc. Long-term Excel users will recall that Excel has historically provided a separate Print Preview window that made it easy to zoom in and adjust settings. Excel 2010 introduced a new “Backstage View” where print preview became embedded into the File menu. Excel 2013 continues this new tradition, but you can get your “old-school” print preview functionality back with a few quick steps. Right-click on the QAT and then choose Customize Quick Access Toolbar. When the Excel Options dialog box appears, choose Commands Not in the Ribbon. Scroll down the list until you find Print Preview Full Screen. Alternatively, you can click once on one of the first commands on the list, and then press P to jump down the list close to where Print Preview Full Screen resides. 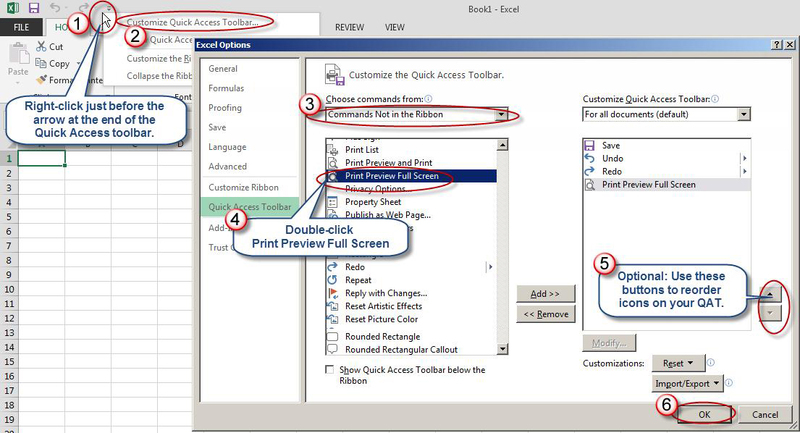 Double-click on Print Preview Full Screen to add it to your Quick Access Toolbar. You can also click once on it and choose Add, but double-clicking saves a step. Note that it's important to choose Print Preview Full Screen as opposed to Print Preview and Print. The latter simply provides easier access to the Backstage View on the File menu. Optionally, move Print Preview Full Screen further up the list. Each icon on the QAT is given a numeric keyboard shortcut. As shown in Figure 1, Print Preview Full Screen is the fourth icon on the list. This means on my computer I can press Alt-4 to display the classic Print Preview screen. Click OK once you're satisfied with the positioning of the new icon on your QAT. Figure 1: Adding a hidden command restores classic Print Preview in Excel 2010 and later. Click the arrow at the end of the QAT. 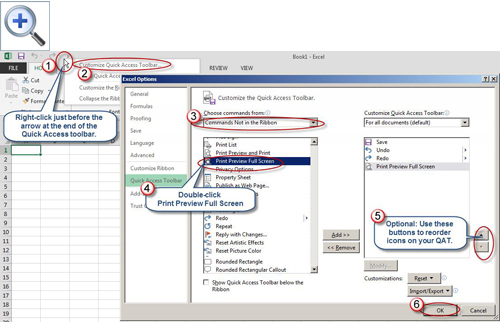 Figure 2: Excel 2007 users can add Print Preview to the QAT with two mouse clicks. 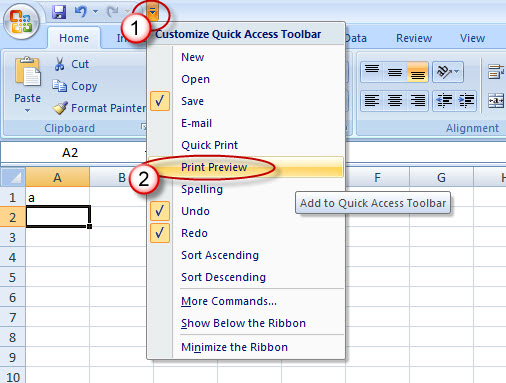 If at some point in the future you want to remove Print Preview or other icons from your QAT in Excel 2007 or later, simply right-click on the icon within the QAT and choose Remove From Quick Access Toolbar. Right-click on the QAT and choose Customize Quick Access Toolbar. Choose All Commands (instead of Commands Not in the Ribbon as you did in Excel). Double-click Print Preview Edit Mode (instead of Print Preview Full Screen). You may see a Print Preview Full Screen command, but in Word that command doesn't work in the same fashion as Excel.